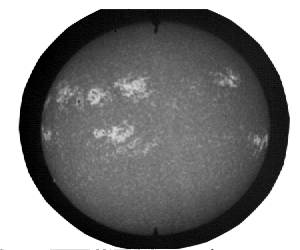 Example Image from Chromosphere_Calcium_MtWilson series. The calcium datasets consist of full-disk images of the sun in Calcium (Ca) II K wavelength (393.4 nm). Ca II K imagery reveal magnetic structures of the sun from about 500 to 2000 km above the photosphere that are not evident in white light images. The chromosphere is an extremely dynamic layer of the sun consisting of a mixture of hot ionized plasma and cool gas. The presence of calcium ions in the chromospheric (along with other ions such as helium and hydrogen) lead to the absorption of radiant emission from the sun. The Ca II K absorption lines are extremely sensitive to local magnetic fields wherein the presence of stronger magnetic fields results in less absorption (brighter features) than weaker fields (more absorption = darker features). Unique features of the chromosphere evident in Ca II K are plage, pores, supergranulation cells and the chromospheric network. Also observed in Ca II K are solar features typically discussed in the context of the photosphere, including sunspots and faculae. Sunspots in photospheric observations appear as dark regions due to the cooler temperatures (~3000 oK) of the overlying gas compared to the surrounding solar surface (~5500 oK). Although sunspots are regions of intense solar magnetic activity (i.e. less absorption), the lack of radiant emissions from the underlying photosphere results in chromospheric sunspot regions that remain darker than the surrounding sun. Faculae, on the other hand, are brighter regions in chromospheric observations which result from the concentration of magnetic field lines between solar granules (solar convection cells). Closely associated with faculae are bright areas of chromospheric plage, also referred to as floccule, within solar active regions that are associated with sunspot formation. Solar pores are actually small sunspots that have not yet formed (and may never form) into the standard picture of a dark central umbra surrounded by a somewhat brighter penumbra. Supergranulation cells are large regions of convective horizontal flows (larger than individual granules) wherein solar material and an embedded magnetic field flow radially outward from the center and downward at the outer boundaries causing the web-like appearance of the chromospheric network structure. All images and related documentation. Data Stewardship includes the Archive, Access, and Assessment (AAA) of operational and related solar and space environmental datasets. Purpose Scientific data stewardship of solar-terrestrial datasets in compliance with NOAA Administrative Order (NAO) 212-12, "Management of Environmental and Geospatial Data and Information", dated 04 Nov 10. Scientific Data Stewardship includes the Archive, Access, and Assessment (AAA) of operational and related solar and space environmental datasets.